Nirmaan, as a part of Operation Sahaaya is working actively on flood rehabilitation for most affected villages in Thrissur and Ernakulum districts of Kerala. Our "Livelihoods Support Program" aims to accelerate the restoration of lost livelihoods of the economically poor families through livelihood kits. Our "Education Support Program" aims to accelerate the restoration of infrastructure of the government schools and provide education kits to the children.We also appeal for CSR partnership to adopt one village in Chalakudy region of Thrissur district OR Paravur region of Ernakulum district towards livelihoods & education restoration. The need assessment is in progress to identify the no of affected families village wise. 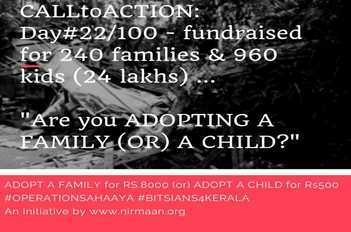 We need few more days to estimate funds required for one village adoption. *Please note: All donations are exempted under 80G.